15kW solar systems are a great system size for homes with high levels of energy consumption or businesses with small to middling energy needs – provided that they have sufficient roof space to install one. This article takes you through (almost) everything you might want to know about 15kW solar systems, including how much space they take up, how much they cost, and how much energy you can expect them to produce. It also touches on whether a 15kW system is a good investment for your home or business. 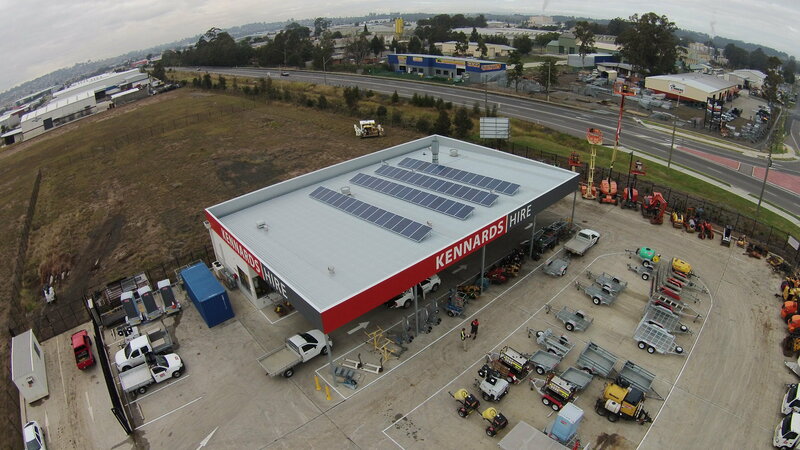 A 15kW solar system for Kennards Hire in Rutherford, NSW. How many panels & how much roof space for a 15kW solar system? A modern-day 15kW solar system will be comprised of between about 45-60 panels and will require about 80-100 m2 of roof space, depending on the wattage of the panels (which are typically between 250-330W each). This means that for most homes, a 15kW solar system will not be an option unless it is ground-mounted. You can explore your own roof’s solar potential here. How much does a 15kW solar system cost? For anyone looking to install a 15kW solar system, this price point can act as a reference point – some installers will offer a lower price, while others will offer a higher price. The thing to look for is the comparative value of the system – a balance between quality products and price. The chart below give a rough idea of what average prices for 15kW solar system look like in (most of) Australia’s capital cities, as of March 2018. After quotes & current pricing for a 15kW solar system? Is a 15kW solar system right for your home or business? Because of the complexity involved (not to mention the cost) we recommend that you have the numbers crunched in detail before deciding to go ahead with a 15kW solar system. You can experiment with the numbers yourself with our Simple Solar System Sizing Estimator, check out our Solar Payback & ROI Estimator Tool or request a free, customised business case analysis from our engineering team based on your electricity bills. 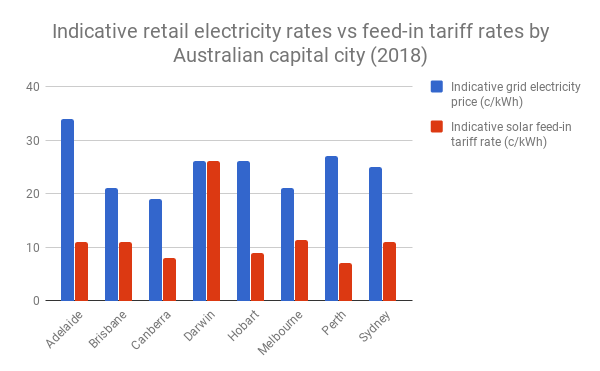 We note, however, that eligibility for feed-in tariffs depends in part on the system size – some retailers in some locations may not pay out feed-in tariffs on systems over 10kW in capacity. Make sure you incorporate this into your analysis before making a decision about your system size. The table below takes a look at payback times and internal rate of return (IRR) for those who install a 15kW solar system in select cities at two rates of self-consumption – 40% and 70%. Although these rates are high for most ordinary households with solar (typically more like 20-40%), we assume that anyone who goes ahead with a system in the 15kW range has done their research and ensured that a higher degree of their solar energy will go directly to their local energy demand (as opposed to into the grid). If you manage to achieve even higher self-consumption rates, the returns will look even more favourable. Please note that we’ve assumed that the system is eligible for a solar feed-in tariff – which may not be the case in reality, depending on the retailer and the network.